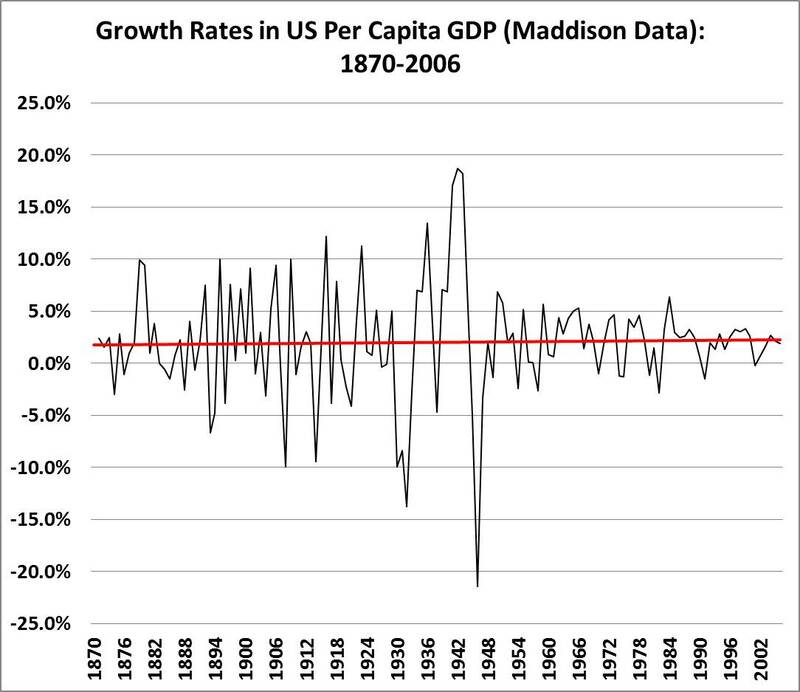 Writing in the Financial Times, Martin Wolf, one of my favorite economists, is the latest to uncritically accept Northwestern economist Robert Gordon's claims that there was no per capita economic growth before 1750 and that US GDP growth rates plummeted from 1950 to 2006. As we've seen, both claims are incorrect. For most of history, next to no measurable growth in output per person occurred. What growth did occur came from rising population. This is not the case. Per capita economic growth was significant and economically transformative prior to 1750, according to the research cited by Gordon for the United Kingdom (PDF). 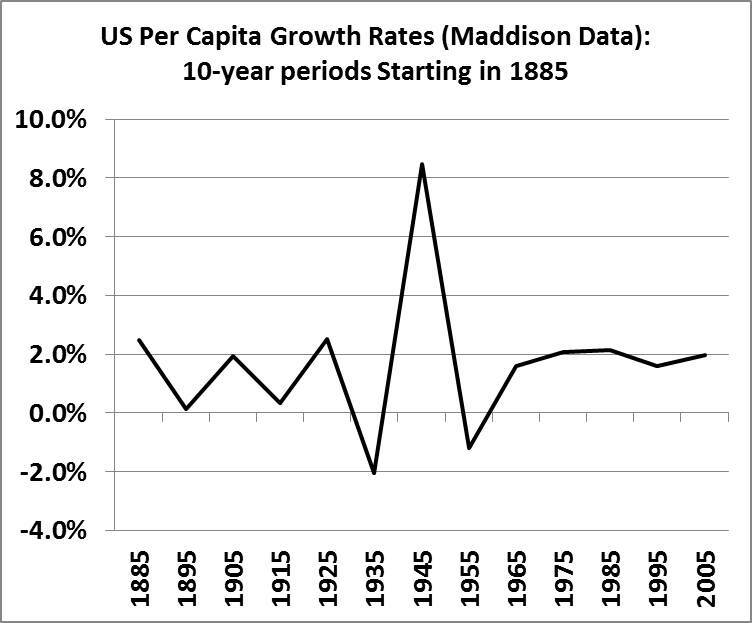 Far more importantly than what happened before 1750, Wolf republishes Gordon's "stair step decline" graph which shows rates of per capita GDP growth dropping from about 2.5% per year in 1950 to about half that a half-century later. As I have shown from multiple datasets, that trend is not supported by the data. 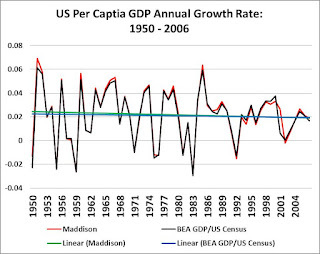 A linear trend on rates of change in per capita GDP from 1950 to 2006 shows very little deviation from a 2.0% growth rate, as indicated in the graph above. How might one fool oneself into thinking otherwise? 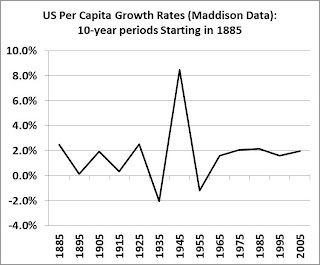 Consider the graph above which shows change in per capita growth rates for each decade from 1885 (that is, the first point shows per capita GDP growth from 1885-1895, the second point 1895-1905, etc, based on Maddison data cited by Gordon). The data might arguably be used to support a claim of a slowdown in growth rates since 1950. But hold on a second. 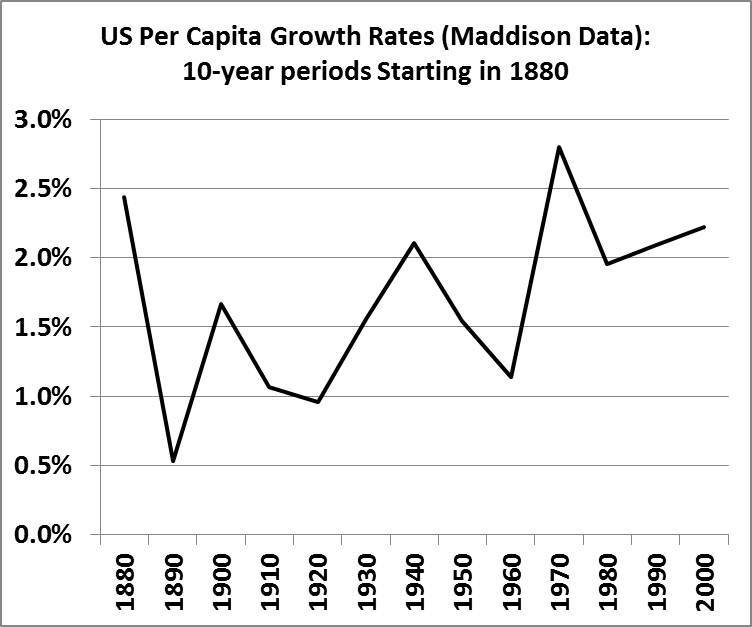 Consider the graph immediately above which shows the same Maddison data, except the data begins in 1880 (i.e., the first point shows the growth rate in per capita GDP 1880-1890, the second point 1890-1900). 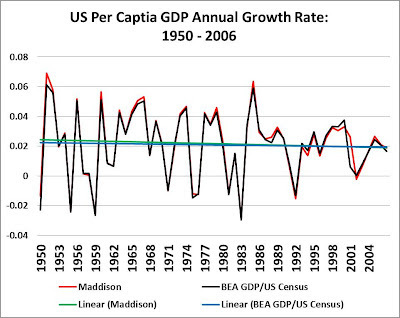 This way of analyzing the data shows what seems to be an increase in per capita GDP growth rates from mid-century. Which is correct? Well, they both are "correct" from a mathematical perspective. From an economic perspective, what the two graphs tell you is that the data is noisy and start and end points for analysis make a big difference. The different pictures also offer a warning about the perils of taking trends off of smoothed data. Above is all of the data at annual resolution from 1870 to 2006. 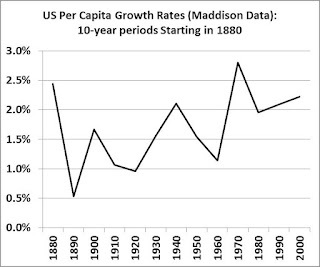 The data show a remarkable lack of trend (red line) over 136 years. There is a notable change in variability following World War II which presumably reflects the impacts of explicit monetary policies. But over the long term, is there evidence of a great slowdown in rates of per capita economic growth? The answer is no. Martin Wolf has promised me that he'd take a look at the data himself, which I appreciate. As the motto of Royal Society says, nullius in verba. Mistakes can easily occur in any analysis. The important thing is what is done once they are recognized. Does Federal R&D Drive Economic Growth? 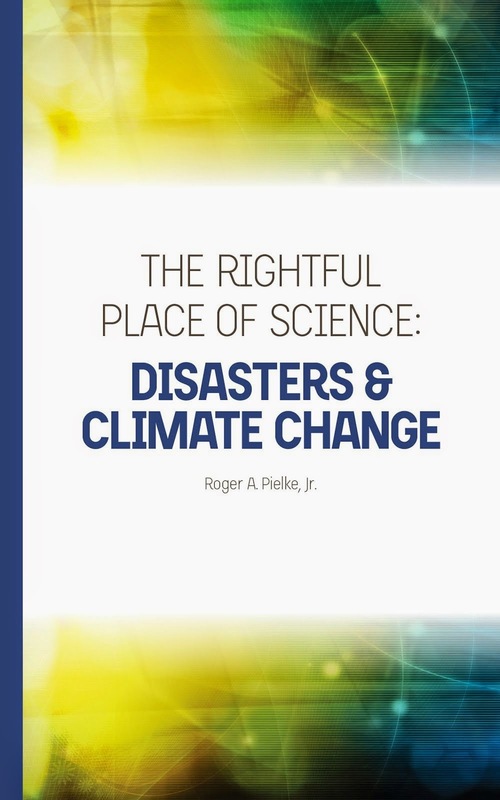 What is Wrong with Embellishing Science? 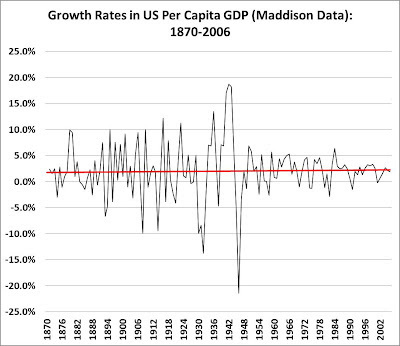 Is US Per Capita GDP Growth in Decline?